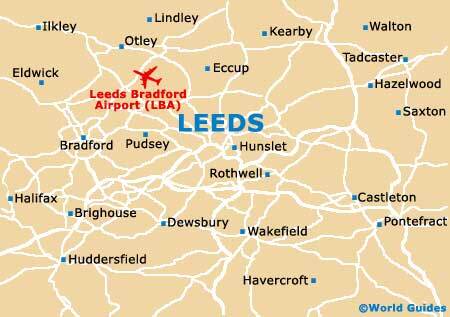 An important city and metropolitan borough residing within the county of West Yorkshire, Leeds is second-only to London as a city for business, commerce, economy and financial services. The region's network of roads and public transportation is very much centred around Leeds, being maintained by the city and the West Yorkshire Passenger Transport Executive organisation. Both the M1 and M62 motorways are to be found intersecting the southern side of the city, while the A1(M) lies to the east. There is also an urban motorway network, with the M621 linking the city centre, along with both Inner and Outer ring roads. Many significant landmarks live within the city, such as Leeds Town Hall and the Corn Exchange, as well as the City Museum, which graces the Millennium Square and was founded in 1819, being closed in the mid-1960s and reopened again in 2008, following a National Lottery heritage grant of almost £20 million. On the skyline of the city, two white buildings are clearly visible, namely the Civic Hall and the university's Parkinson building. There are a number of tourism offices throughout Leeds, with the principal outlet being located within the city's railway station, just off Princes Square and the Wharf Approach. Sited nearby Leeds Town Hall and the Central Library, this award-winning tourist centre provides a wide range of useful leaflets and souvenirs. 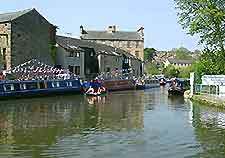 Residing on the outskirts of Leeds, Otley is a particularly scenic town and the Otley Tourist Information Centre serves as a useful place to visit if you are planning to explore this spot, with maps being available here. 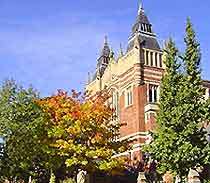 Leeds University is one of the premier universities in the north of England. With numerous buildings, theatres, lecture halls and excellent facilities, the campus is home to a large student base now numbering in excess of 30,000. The university is situated in the Hyde Park area, lying on the north-western side of the city centre and incorporating St. Georges Park. As in any large city, it is advisable to always maintain an awareness of your surroundings and not look like a tourist when visiting Leeds. Although crime levels in West Yorkshire are fairly low, try to look like you know where you are going and stay alert in crowded places. The cosmopolitan city of Leeds is home to many different cultures and religious beliefs, with most religions having some kind of a presence in West Yorkshire. Located on Cookridge Street and just across from the Millennium Square, Leeds Cathedral (the Cathedral Church of St. Anne) serves as the city's Roman Catholic Diocese, as well as the seat of the bishop. Other prominent places of worship in the city include the Parish Church on Kirkgate and St. George's Church on Great George Street, while the ruins of outlying Kirkstall Abbey offer an insight into the area's religious past and monastic heritage. Most pharmacies in Leeds city centre open from 09:00 until around 18:00, while supermarkets often come with their very own in-store chemists. Drugstores will usually open until 18:00, although some may stay open until later, and these usually have pharmacy counters for dispensing prescriptions and medicines. Boots the Chemist is the biggest and most familiar chain and features no less than eight separate outlets in the city, including those based at the Railway Station on Aire Street, Albion Arcade and Merrion Street. Tipping in Leeds is fairly discretionary, with most taxi drivers usually being given a 10% gratuity or thereabouts, although some passengers simply choose to round up the fare to the nearest pound or two. However, it should be noted that tipping taxi cabs is by no means essential. Most of the principal dining establishments in the city tend to include service charges and these are always clearly stated on the menus, otherwise it is usual to tip around 10% in recognition of prompt and courteous service. Hotel staff, such as porters, happily accept a tip of one or two pounds. Generally, no other public service workers in the city expect to be tipped. Public buildings and public transport in Leeds restrict smoking and this is usually clearly indicated by prominent no-smoking signs. From July 2007, it is no longer possible to smoke inside all restaurants, public houses and bars, although some now cater for smokers by providing outdoor areas during the summer months, while the most family friendly pubs may even restrict smoking in their beer gardens. Smoking in Leeds, and England as a whole, is no longer as fashionable as it once was, so it is always worth exercising discretion and sensitivity when selecting a place in which to smoke. The best advice would be not to smoke in enclosed spaces, unless you are confident that you are allowed and that those around you won't have any objections. Much business is done over the dinner table in Leeds and business lunches are often held at restaurants within the city centre. The most notable of the city's dining establishments will come with a comprehensive wine list, while tables should be booked in advance if possible, particularly on Friday and Saturday nights. Alternatively, business dinners may well be conducted at home and these tend to be fairly informal occasions. Leeds has an enormous selection of public houses, often with views of the surrounding countryside. Most pubs and wine bars are friendly places - if there is a good mix of people you can be sure that it is a good pub, otherwise, just close the door and head to another nearby.